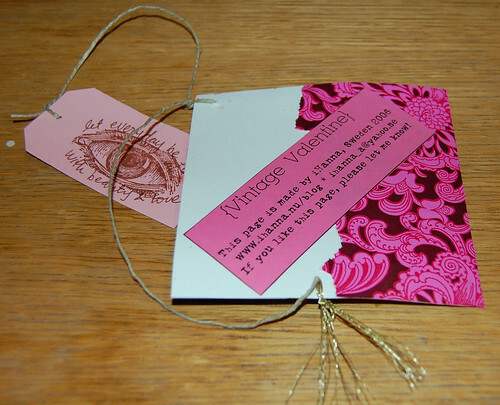 I singed up for Joleens project Vintage Valentine, a chunky book where 40 artists contributed with 40 pages each. Joleen got them all and sorted them out, bound them together with a big fat spiral binding. This is how I made my page, the first chunky book page ever, or hmm… the 40 first ones! It was a lot of cutting and gluing, I can tell ya! The page in it self is not chunky, but when put together with the other participants pages it becomes a chunky book. 1. Made the design of the page on the computer. 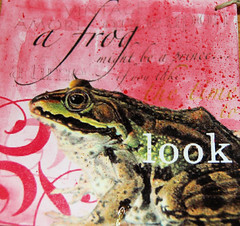 Added frog, text, swirls. Should’ve scanned a design but couldn’t get a scanner at the time. 2. Printed and cut out the 40 pages. 3. Cut out cardstock and glued the pages to make it thicker. The pages are 4 x 4 inches (very small). 4. Thought the page was to white/clean, so I watercoloured all the backgrounds with red colour, and added some glitter to the frog. 5. 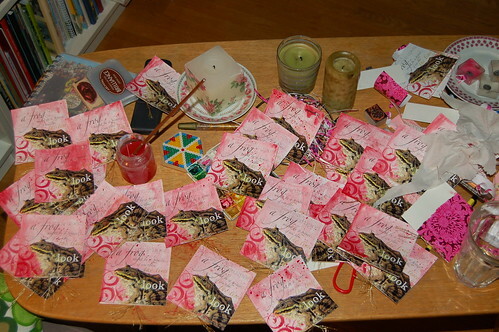 Cut out 40 pink tags. I wrote X X X on and stamped an eye to match the theme. Added these tags to each page. Also tried to stamp them with a frog punch that I borrowed from my mother (but it stopped working after about half the tags was punched). 6. Printed 40 labels with my name and contact information on (on pink paper) and cut all of them out, glued them on the backside of each page after I added some favorite wrapping paper to spice the backside up some. 7. Also added a little tuft of golden embroidery yarn with a needle to each page. I don’t want to see these 40 pages ever again! 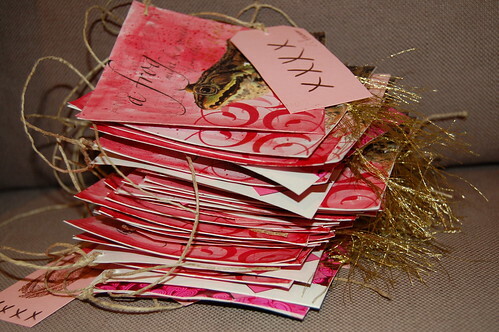 I value the Vintage Valentine book with all it’s embellishments and cool pages, and I’m so thankful to all the participants (thank you!). But I’m not doing this again very soon. So I guess I wasn’t hooked, but I’m so glad I tryed it out! I think you should too, but maybe sing up for a smaller amount of pages and plan the details off each page a little better than I did! Find out more about Chunky fat books and how to swap them. 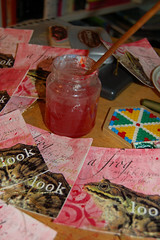 View the Chunky book arts pool at flickr. Good luck if you decide to try this! What fits into a matchbox? 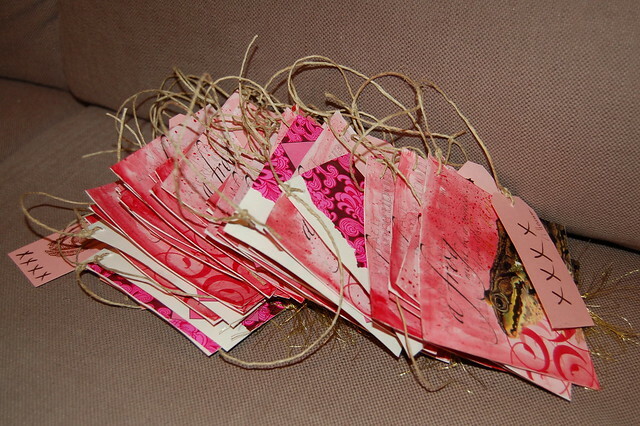 This entry was posted in Paper Crafting, Tutorials and tagged chunky book, swapping, unbound pages, valentine. Bookmark the permalink. Oj, vilket jobb! Men det måste ha varit kul att få se slutresultatet senare. i love your chunky book page! you put a LOT of work into this!! ;) I am in the vintage valentine book as well, and haven’t received the book yet, so it’s fun to get a sneak preview of one of the pages. Boy, have you been busy! You have such good ideas! I think I may try the chunky book, maybe I can organize one here in Sweden!? It looks great! That’s alot of work put into this Chunky Book Page. Good job! Thank you for visiting my blog the other day. Your blog is full of wonderful creations. I just finished making my Cashmere top and the Pointy Kitty. This is one of the coolest fat book pages – ever! I absolutely adore the frog!! The whole graphic look of it. . .wonderful! LOVE this idea. Is there anyway you are doing another one? Would love to join in. I am an artist who works in photography textiles and paper. I also work alot with found objects. Looking forward to hearing from you. Thought your work was fantastic. Love your blog. Hey and Hi! I was in that chunky book too! I’m going to go look at your page in my book. Wow, it makes the planet seem smaller to connect with someone who lives so far away. I live near Portland, Oregon. I love your blog; you do wonderful art.